So H5 is about 20, 000 feet in the atmosphere. These winds steer our surface lows. Its the first layer that we call the jet stream. Its the energy in this level that ultimately leads to our surface LP. As you can see in this picture the flow has been cutoff, the three black circles labeled in yellow 1 2 and 3 centered over the S NE coast. The winds at 20,000ft are turned back around towards the west instead of continuing up into the Canadian Maritime like where the black number 4 is located. The red L is our surface LP. It remains trapped if you will under this closed upper level circulation and cant continue into the Canadian maritime. Once it opens up the LP will race out of here, sometime on Tuesday PM. 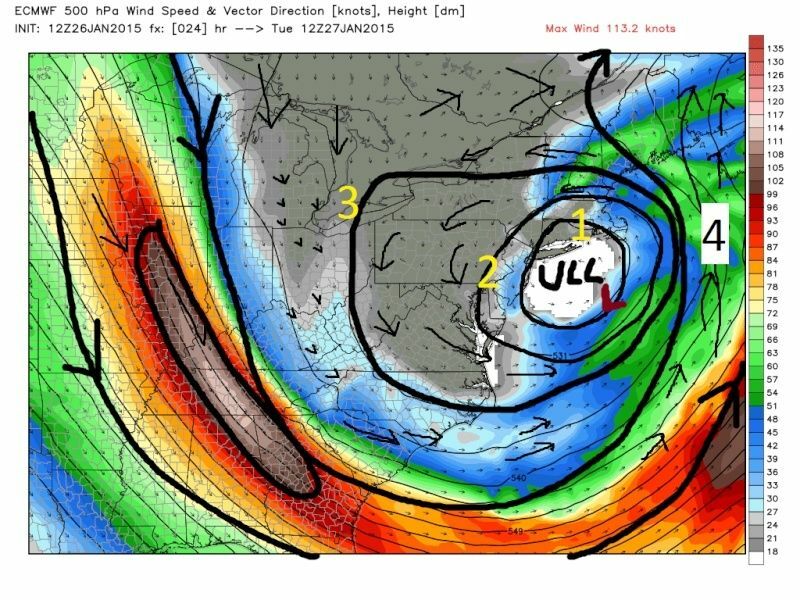 The area on the left side of the trough I have circled in black is called a jet streak. An area where winds accelerate and decelerate rapidly. Once that streak rounds the base of that trough it will cause the closed circulation to open up and lift the trough out off the coast. How about when you hear that the surface low has stalled out, it's just sitting there. How does that happen? When there is a cutoff Low in the upper levels.....Picture a river. The flow of water is similar to the flow of air. As the water approaches a sharp turn (base of the trough) it will accelerate as it rounds the turn. The water on the inside of the turn travels faster than the outside of the turn. As the water whips around the inside of the of the turn it can generate an eddy, if you will, or swirl of water on the other side (closes off the flow). Most of the water just keeps on moving down stream; however, the water beneath the surface of an eddy is much calmer. Fish like to sit in the eddies and wait for food to come by. On the other hand the water under the main current(or jet stream) is moving just as fast and strong as the surface. So in this analogy the surface Low is the fish. As long as there remains a closed circulation obove it the surface Low will slow down from the main flow because the current if you will is slower than the main flow. Once the upper levels open back up the surface Low gets whisked away in the much faster jet stream. Feel free to ask more questions about this thread if you'd like and we can continue the discussion.